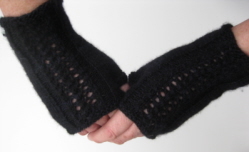 The cable panel adds interest to these cosy mitts and provides a good introduction to cabling. 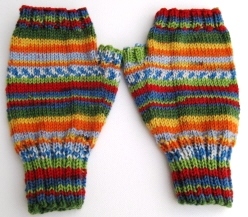 The mitts are knitted in the round on 3.00mm double-pointed needles. 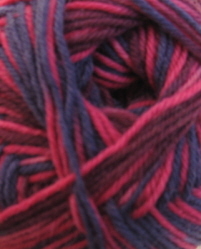 Shown here knitted in Baby Alpaca 627 Dill but suitable for any DK weight yarn. 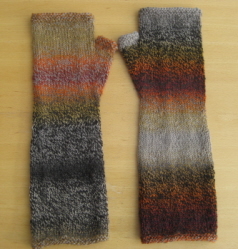 These fingerless mitts are great for showing off the brilliant colours of Knitcol 100% merino yarn. 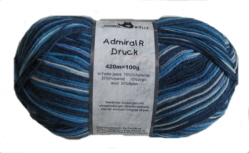 The pattern - for men and women - takes just 50g of yarn. These long gauntlets are quick and easy to make. The pattern is suitable for any DK yarn but the simple stocking stitch pattern looks most effective with self-patterning or variegated yarns. 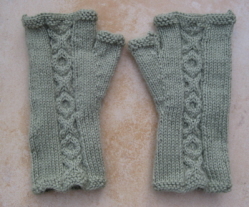 The gauntlets shown are knitted in Zauberball Crazy 6ply, shade 2092.